Give your feathered friends a festive treat this winter (and make your trees look pretty, too!) 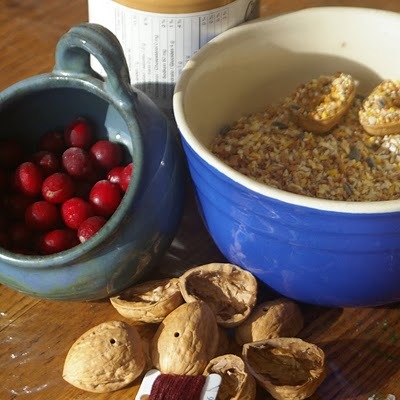 with these fun, simple bird feeders from Lori. Hang vertically, or create unique garlands to decorate the outdoors for the season! If your house is anything like ours, we are often over run with crafts, so this craft, being consumable and meant to go outdoors, was just what we needed on a sunny day home sick from school and seemed just right for the season! The tutorial shows the craft being done (almost) independently by a just-turned-5 year old. Younger children will enjoy picking the elements for their own special garland and leaving the needle work to a grownup. 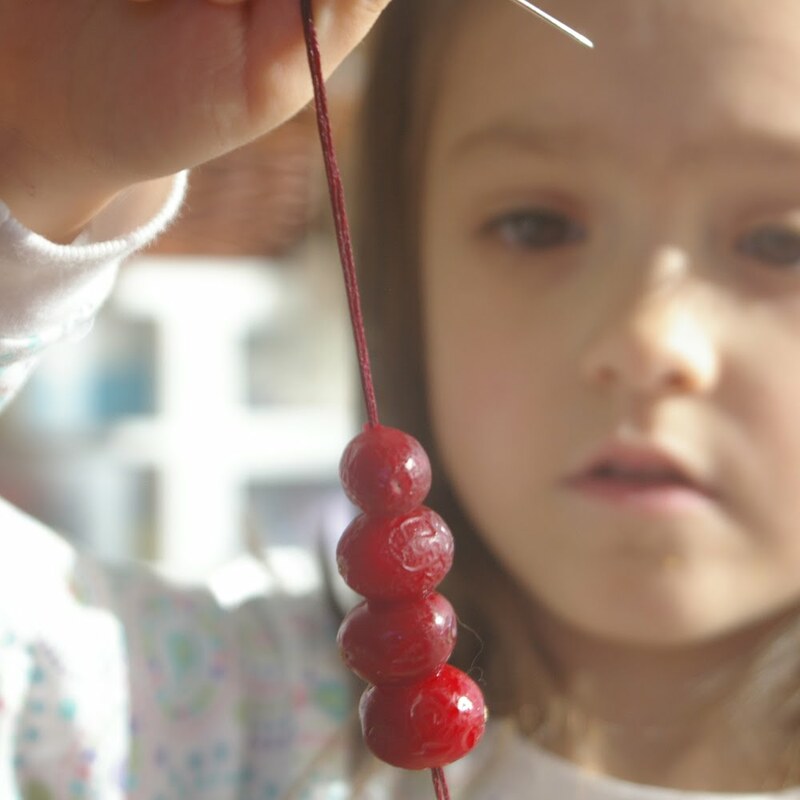 This craft helps to build fine motor skills and is *great* pattern building exercise for those kindergarteners who are starting to work on math skills by detecting and predicting patterns. This craft is easy to make with items commonly available throughout the holiday season. * halve the walnuts and drill a small hole in each half shell. * if using fresh cranberries buy frozen or freeze : they are easier to thread and *much* less messy! 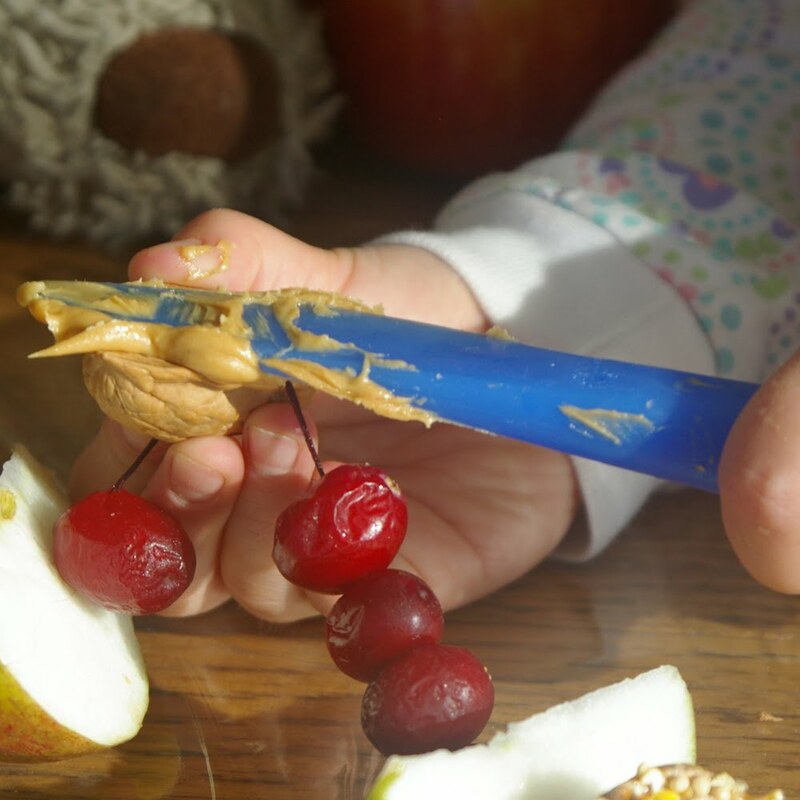 * if working with younger children, or concerned about mess, fill the walnut shells with peanut butter ahead of time, cover with bird seed as shown in the directions below and chill. This means less peanut butter slopping about, but the kids can still get a needle through. 1) Gather your materials and prepared supplies. 2) Tie several knots in one tail of your string. Thread the other end through the tapestry needle. 3) Invite your child to lay out the elements they wish to add to their garland feeder, or just get started threading pieces onto the string. 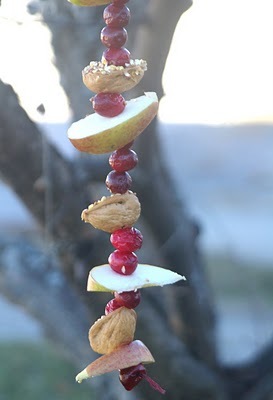 4) We have pictured adding peanut butter and bird seed to the walnuts after stringing the entire garland. An alternative, as suggested above, is to fill and chill them in advance. 5) Once the garland feeder reaches the desired length, remove the needle and tie a loop and then hang this on your favourite limb outdoors for the birds to enjoy! Beneath the Rowan Tree is currently on vacation for welcome rest, renewal and family time. 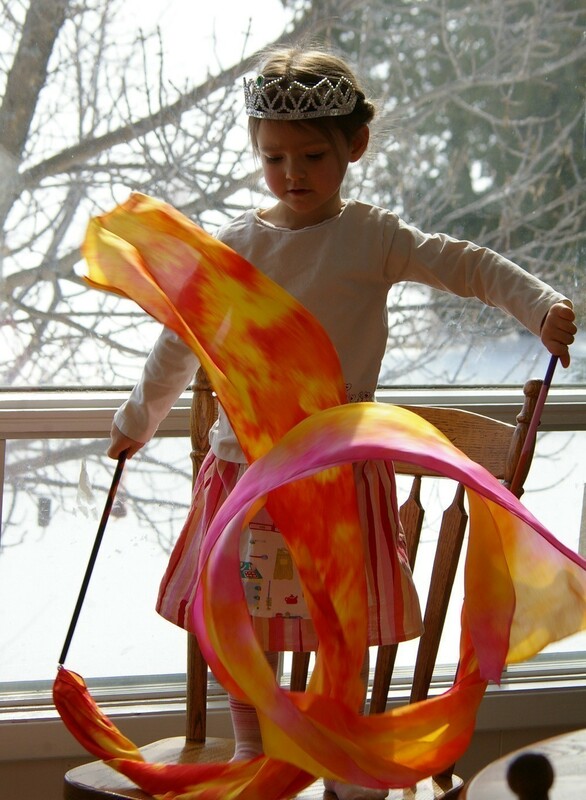 They’ll open shop again January 5 with more hand dyed playsilks, Fairy Silkies ™, wooden games, ribbon toys and more. And Twirl Skirts! Don’t forget the Twirl Skirts! This is just beautiful. Thank you, I will do this next week with my children!